Buying a mattress isn’t always easy. There are so many options to consider, and many of the mattresses appear quite similar. If you are choosing between the Nolan and Leesa mattresses, I have broken them down based on construction, firmness, and other factors. This should help make your decision an easy one. Read on for my comparison of these two mattresses. They are both the same height. The Nolah is softer than the Leesa. Their top layers are made of different proprietary foams with different feels. 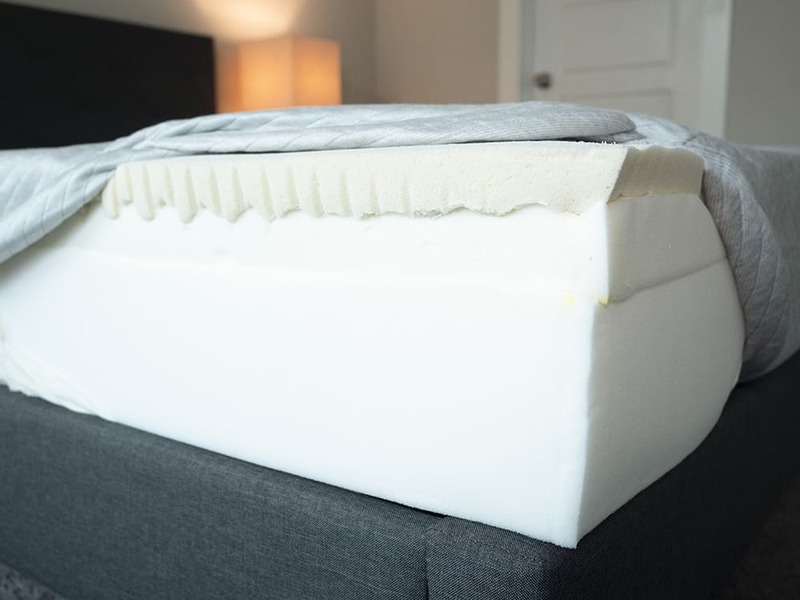 The memory foam-like AirFoam is on the first layer of the Nolah, while memory foam is in the second layer of the Leesa. The Nolah is 10” tall. The cover is thin and fairly soft. First, there are 2” of a soft and responsive AirFoam. Next, there is 1” of a latex-like Avena foam. Finally, there is a 7” high density base foam support layer. Then, there is a 2” layer of contouring memory foam. Both mattresses have soft, thin covers. Neither should stop you from engaging with the mattress. The mattresses are the same height with similar base layers. The comfort layer on the Leesa is thicker than it is on the Nolah. The first layer of the Nolah is AirFoam. It is designed to relieve pressure and dissipate heat. It feels similar to memory foam, so you will sleep more “in” the mattress. The first layer of the Leesa is called Avena Foam. It is latex-like and has more bounce. This gives it a balanced foam feel so that you sleep more “on” the mattress. I felt like the Nolah was a 5.5/10, softer than average. It is one of the softest mattresses I have reviewed. I thought the Leesa was more like a 6.5/10, about average. With the Nolah, I definitely sink into the mattress. It feels best when I am on my side. It has more of that sinking-in memory foam feel. I definitely felt like I was sleeping “in” the mattress. However, heavier people may press through and feel the firmer support layers. With the Leesa, I felt better support on my back and stomach. It had more of a balanced foam feel and it was easier to move around on the mattress than it was on the Nolah. 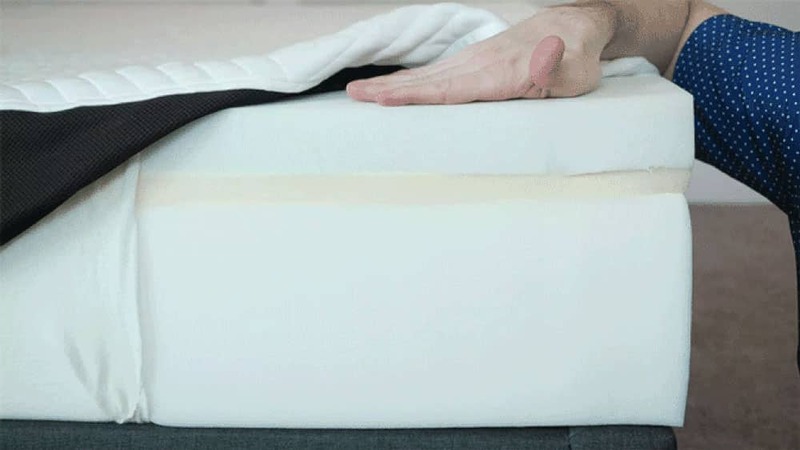 See how the Nolah mattress responds to pressure in the video below. Watch how the responsive Leesa mattress may be a better choice if you want to move around easily at night. The Nolah performs a bit better with motion isolation. I think this is because it has more of a memory foam feel. This cuts down on the motion you may feel from your partner while you are trying to sleep, so it should be the better choice for couples. See how the Nolah cuts down on motion transfer in the video below. The Leesa could also be a good option for couples. You shouldn’t your partner’s movements on your side of the bed. The Leesa features better edge support than the Nolah. It is a firmer mattress, so it doesn’t collapse as much when I sit near the edge. This allows me to use more of the surface area of the mattress, and I don’t feel like I am going to fall off the mattress when I lie near the edge. I thought the Nolah was a 7/10 and the Leesa was 7.5/10. I felt that the Nolah was considerably firmer than Joe did. I think this is because I push through the thinner comfort layer and feel the firmer layers beneath. I felt some pressure on my side on both, especially compared to Joe. However, it wasn’t too intense. On my back on both, I felt good overall support. However, on my stomach, I didn’t feel good support on either. The Leesa is the firmer mattress of the two so, if you’re my size and a stomach sleeper, this is the better choice out of the two. While our numbers were different, Marten and I agreed that the Nolah is the softer of the two mattresses. I am not surprised that Marten, being a larger person, pushed through the comfort layer of the Nolah and felt pressure on his side. You are a side sleeper. The AirFoam relieves pressure very well. When I was on my side, I felt very little pressure on my shoulders and hips. However, if you are a heavier person, you may press through the soft upper layer and feel the firmer layers beneath. You prefer a softer mattress. This the softer of the two mattresses so, if you are a back sleeper who wants less firmness, this could be the better pick. You like more of a memory foam feel. If you prefer the feeling of sinking into your mattress, you are going to get that with the Nolah. If you like sleeping more “in” the mattress rather than “on” it, this could be the choice for you. You are a stomach and back sleeper. This is the firmer of the two mattresses, and I think it gives better overall support in these positions. I definitely felt my hips sinking in a bit too far when I was on the Nolah, but not so much with the Leesa. You are a heavier side sleeper. With the Nolah, you have more of a chance of bottoming out. With the Leesa, it is less likely that you will push through the soft layers down to the firmer layers beneath. Heavier people may find this to be a better fit when they are on their side. You prefer a balanced foam feel. If you don’t like the feeling of slowly sinking into your mattress, you may prefer the Leesa. This mattress has more of a balanced foam feel that makes it easier to move around. Taking a closer look at these two mattresses, they both have features that could benefit different types of sleepers. The softer Nolah should be better for side sleepers who like a classic memory foam feel, while the Leesa should work for stomach and back sleepers who prefer a balanced foam feel. Also, if you are a heavier person, the Leesa may also be a good choice if you sleep primarily on your side. Please leave any specific comments or questions about the GhostBed or Lull in the comment section below. What about temperature? Does the Leesa sleep cool or hot? It should be pretty temperature neutral too. Not hot or cold.